Media in the Middle East are mostly keeping to the battle lines already drawn over the conflict in Syria: Pro-opposition outlets blame Damascus for the ceasefire breakdown, and pro-Syrian media are pointing the finger elsewhere. But the mood of Russian commentators, after Washington accused Russian forces of air strikes on an aid convoy outside Aleppo, is verging on the belligerent. Qatari daily Al-Watan blames the Syrian government for the truce failure. "Damascus and Moscow were stupid to consider everyone who raised weapons against the regime a terrorist. This is not reasonable as all Syrian people took up arms against the regime," it asserts. It adds that US Secretary of State John Kerry warned the Russians of the need to pressure Syrian President Bashar al-Assad to force the regime to abide by the ceasefire. Saudi Al-Yawm accuses the Syrian regime of turning the conflict into a sectarian confrontation "through its alliance with Iran and Hezbollah", adding that Russian air strikes on Sunni districts strengthen the idea of a Shia versus Sunni conflict in the region. But Syria's Al-Baath newspaper says it is the US's fault, declaring that Damascus took the initiative to abide by the ceasefire. "Unfortunately, the US and its allies undermined the deal and the truce was blown away," it says. Lebanon's Al-Safir disagrees with allegations that Syrian and Russian forces were behind the aid convoy attack, saying the Syrian opposition was using the incident for political purposes. 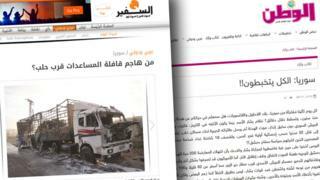 The attack, it says, came "after three days of confrontations between armed groups... about the fate of the aid". Iranian dailies stand firmly behind Damascus. Hard-line Keyhan insists the regime kept to the rules: "Following 300 instances of ceasefire violation by terrorists, Damascus formally announces end of ceasefire, Syria resumes attacks on terrorists". Lebanon's Annahar newspaper suggests it would be better to avoid truces in the future. "It is clear now that the confusing ceasefire agreements in Syria are more dangerous than the battles themselves," it says. And Israeli pro-Netanyahu Yisrael Hayom believes "the ceasefire agreement in Syria was not worth the paper on which it was written". Pan-Arab Al-Hayat declares "a ceasefire does not exist in the culture of Assad's family and his regime". In Russia, papers believe the crisis in Syria is heating up. Influential daily Kommersant opines that "the humanitarian convoy incident in Aleppo opens the road to a full-scale war". Liberal Novaya Gazeta, often critical of the Kremlin, is also pessimistic, saying experts believe "the Syrian crisis is now at the stage when diplomacy is helpless". And pro-government daily Izvestia thinks either "the opposition forces themselves decided to fuel the situation and opened fire at the convoy, or they received an order from the US to do so".